Lawyers for Michael Jackson have settled a lawsuit brought by a finance company that claimed the pop star cheated it out of $48 million (euro35.8 million). The lawsuit by Prescient Acquisition, of Hackensack, New Jersey, was settled Monday just as jury selection was to begin in U.S. District Court in Manhattan. Terms of the settlement were not released. Steven Altman, a lawyer for Prescient owner Darien Dash, said the businessman was owed the money for helping Jackson refinance a $272 million (euro202.9 million) bank loan and secure $573 million (euro427.5 million) in financing to buy Sony's half of the Beatles' song catalog that Sony co-owned with Jackson. "We're very pleased with the settlement, although the terms of it we've agreed to keep confidential at Mr. Jackson's request," Altman said. Jackson, 48, had said he never heard of Dash. "The most important thing is that Michael Jackson's publishing catalog remains safe and sound," said Jackson's lawyer, L. Londell McMillan, whose clients have included Prince and Stevie Wonder. The settlement, McMillan added, "presents a win-win for everybody." The lawsuit was one of a number of recent suits involving Jackson and former business associates. Last year, a jury in California awarded a former Jackson adviser $900,000 (euro671,441 for work he did on videos intended to rehabilitate the pop star's image. 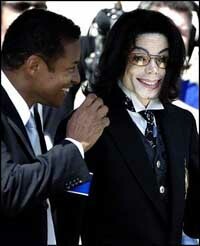 The jury awarded Jackson $200,000 (euro149,209) in a cross-complaint. The entertainment world, he said, is "full of thieves and crooks. That's not new. Everybody knows that."